With deliveries of the new Jawa motorcycles just starting, there is still some time before we see these bikes reaching custom shops all over the country. The factory custom Perak too is said to go on sale only later this year. However, before that happens, we have a small peek into the potential makeovers these bikes can receive. 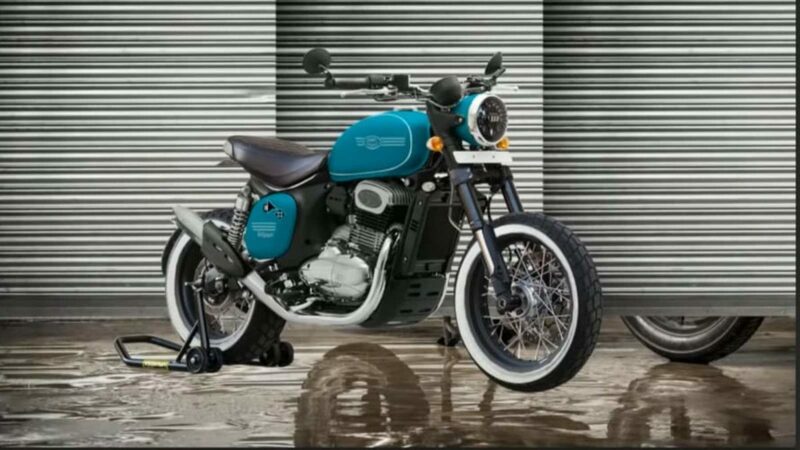 YouTube channel Desi Geek showcases one such render of the new Jawa 42 motorcycle. This modern yet retro-styled motorcycle has been imagined as a scrambler and boy, we can not wait to see the end results, not only in the virtual world but also in the real world. Read ahead and do watch the video linked at the end. The first change done in the render is the tyres which get a white wall. The bike can now be seen with a bit fatter and dual-purpose tyres, lending it with some more ability to handle off-road sections. Then comes in a tail-tidy conversion with a completely new seat, finished in a premium looking quilted pattern, USD forks and an LED headlight. Breaking the new exhaust trend, this render just sweeps the exhaust of the motorcycle upwards, very similar to what we saw in the newly launched Bullet trials. Apart from changing the aesthetics of the bike, the upward swept exhaust would also give the bike more ground clearance to cross obstacles. Completing the package is a new paint scheme in the shade of blue with contrasting white accents and stripes. Do not miss the sump guard which should guard the motor when the going gets rough. Powered by a liquid-cooled, DOHC, single cylinder, 293 cc engine. This engine develops 27 hp and 28 Nm of torque and is paired with a six-speed transmission. Despite being a liquid cooled motor, the engine comes with cooling fins to mimic the look of the older Jawa motorcycles. Engineers behind the production of this engine also worked hard to produce a unique engine note as close to the ones from the older 2-stroke Jawa motorcycles. The cigar-shaped exhausts and the off-set instrument console too, pay homage to the design of the older Jawa motorcycles. 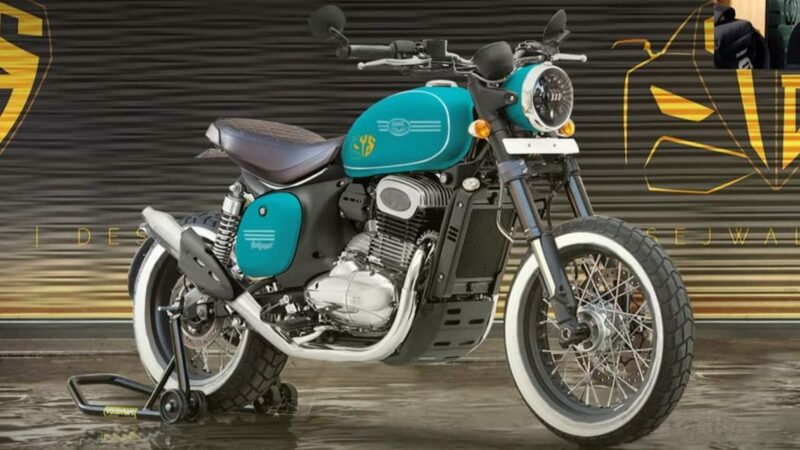 Prices of the new Jawa 42 start from INR 1.55 Lakh for the single disc variant and for the dual disc variant, Jawa has put a price tag of INR 1.63 Lakh. Here is the video showcasing this design render, do have a look.